When you’re hiking or enjoying other outdoor fun with your Group, getting separated from the herd can sometimes happen. If you lose your way, don’t panic – you’re not the first person to get lost on an outing. Whether your Group is exploring urban areas or rustic trails, we’ve prepared some easy tips to keep in mind while you’re adventuring, so you can re-connect with your Section if you get separated. To begin with, packing smart is key. 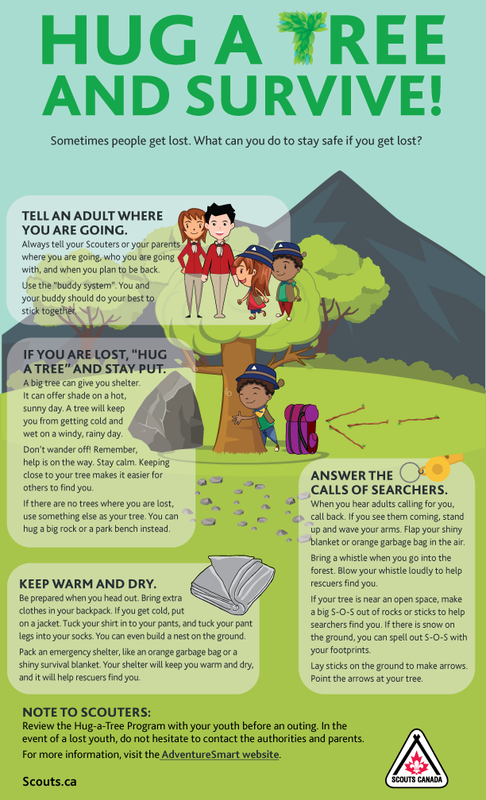 Whether the event is on a nature trail, a city park or zoo, packing smart can prepare you for the elements while waiting for help to arrive, should you lose your way. Bring extra clothes, water and snacks in your backpack. If you get cold, you can put on a jacket, or if it’s a hot day, bring a hat to protect you from the sun when shade is hard to find. During chilly weather, tuck your shirt into your pants and tuck your pant legs into your socks to keep warm. You can even build a nest on the ground for insulation. Also, be sure to pack emergency shelter like an orange garbage bag or a shiny survival blanket. Your shelter will keep you warm and dry, and it will help rescuers find you. Another important thing to remember is keeping adults in the loop. Never stray from the Group by yourself. Always tell your Scouters or your parents where you are going, who you are going with, and when you plan to be back. Use the “buddy system” at all times. While following these tips may seem easy, getting lost can still happen to anyone. So what do you do if you get separated from your Group? “Hug a Tree” and stay put. A big tree can give you shelter. It can offer shade on a hot sunny day. A tree will keep you from getting cold and wet when it’s windy or rainy. While you’re waiting, don’t wander off! Remember – help is on the way. Stay calm. Keeping close to your tree makes it easier for others to find you. If there are no trees where you are lost, use something else as your tree. You can hug a big rock or a park bench instead. Remain aware of your surroundings as you wait. When you hear people calling for you, call back. If you see them nearby, stand up and wave your arms. Flap your shiny blanket or orange garbage bag in the air. Bringing a whistle when you go into the forest is also helpful, as blowing it loudly can guide search parties to your location. If your tree is near an open space, make a big S-O-S out of rocks or sticks to help others find you. If there is snow on the ground, you can spell out S-O-S with your footprints. You can also lay sticks on the ground to make arrows that point to your tree. Going on Group excursions is one of the best parts of the Scouting life, but safety is even more important. By keeping Hug-a-Tree pointers in mind, having fun with your Section and staying together is a breeze. 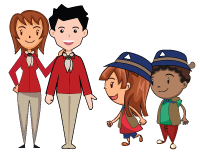 Review the Hug-a-Tree Program with your youth before an outing. In the event of a lost youth, do not hesitate to contact the authorities and parents. 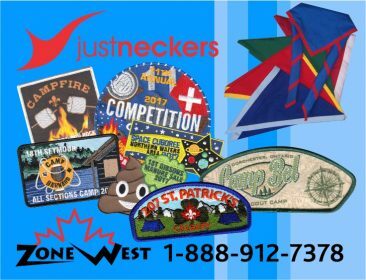 For more information, visit the AdventureSmart website.